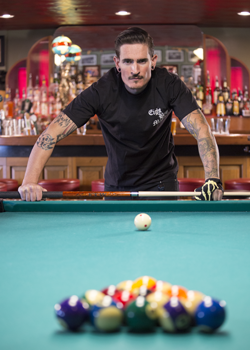 I always find it funny when people ask me if I'm a pool shark. 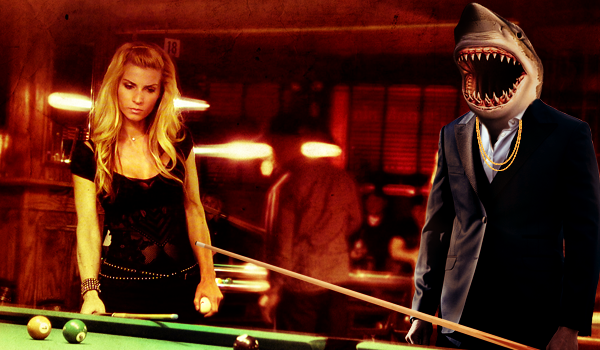 People that aren't part of the pool community frequently use that term, but those of us in the inner sanctum of pool know that a shark is something far different than a great player, and it's not something you ever want to be called. For those of you who don't know what a shark, or sharking is, in a few words it is someone who uses tactics to get in his opponents head. In even less words, a cheater. As long as sports have been around, I'm sure sharking has as well. It doesn't work well for fast paced sports like tennis or soccer, but for quiet games like golf and pool, it can be a very effective way of using bad sportsmanship to gain the upper hand. I have been a victim of everything from someone (a pro) screaming while I was setting up to shoot, people making me rack over and over and over, people fidgeting in my line of sight, someone stealing my Kamui chalk in the middle of a match, someone claiming that I didn't call the winning ball when I clearly did...I could go on and on. Unfortunately, pulling moves seems to have become as much a part of the game as lagging for the break, so you might as well be prepared. The following is a list of common tactics and some ideas on how to deal with them. This person sits in the chair and immediately starts catching up on his to do list. 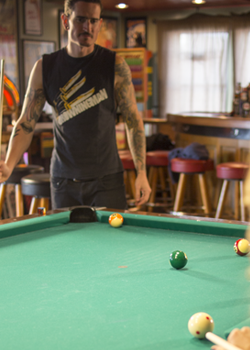 Clean the cue...check. Shape the tip...check. Organize the cue case...check. All in your line of sight. My recommendation: Stop what you are doing immediately and tell them you will resume shooting when they are finished. Do not start shooting again until you are refocused and they are not moving. Everyone is entitled to a good rack, but when your opponent grabs the rack out of your hand, or scatters the balls, or starts verbally battering you for having a tough time getting the balls to freeze, it's time to take action. I've had all of the above happen to me, and I've learned to exercise my right to have the tournament director rack the balls. If they turn down 2 racks, I call the TD over to rack for me. If they have a history of it I call the TD from the first rack. Frank Says: "Make sure no one ever hassles you about a loose rack with the Magic Rack! The original template rack helps you achieve a tight rack, every time." 3. The Not So Low Talker. They turn to those around them and talk loudly enough for you to hear every word. Usually it is something designed to get under your skin. I like to look the person in the eyes and say in the firmest possible voice, "Could you please stop talking? It's my turn to shoot." These are the people who make threats or otherwise try to physically intimidate you. The screamer I mentioned earlier falls into this category. I was so rattled after that I completely lost focus and ended up losing the match. What I should have done was taken a break at that very moment to get my head together, and my heart rate below 140. I should not have come back to the table until I was ready to play again. Being sharked is something we shouldn't have to deal with, but it's not going away any time soon. The only thing we can do is expect it, and develop a strategy for dealing with it. What I have discovered is that people who shark are like bullies, and the worst thing you can do is ignore it, or think you can handle it. You must speak up. Call the person out and let them know you won't tolerate it. If that doesn't work, call the tournament director. You deserve the same courtesy you give your opponent, and you always have the right to refuse to play until you get it.